Algeos, the UK's leading supplier of diabetic footcare products are introducing an exciting new range to augment their existing product range. Koven Hadeco vascular dopplers have now launched in the UK and Ireland under the Diaped brand. Koven Hadeco dopplers are ideal for monitoring, diagnosis, and wound care and are widely used for clinical applications such as Ankle Brachial Index studies and Peripheral Vascular Procedures. The collection features three dopplers to suit a wide range of applications: The Bidop3 Visual Pocket Doppler, Smartdop 45 Vascular Ultrasound Doppler and the Smartdop 30EX Vascular Ultrasound Doppler. 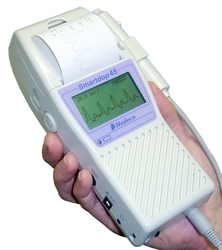 The BIDOP® 3 is a unique, hand-held pocket Doppler that offers diagnostic capabilities previously seen only in large systems. The BIDOP® 3 has a large viewing panel with real-time Doppler waveform display. The built-in microprocessor calculates ratios automatically without the need for manual adjustments. Store up to 30 waveforms for later reference or download to optional Smart-V-Link® vascular software for documentation and reimbursement. An optional PPG (Photoplethysmography) probe for toe pressures is also available. The Smartdop® 45 by Koven Technology is a lightweight, hand-held bidirectional Doppler for assessment of the vascular condition. It has a large visual LCD screen for viewing real-time waveforms and an integrated printer for documentation. Optional PPG and pulse volume is available for toe pressures and PVR studies. The built-in microprocessor calculates ratios automatically without the need for manual adjustments. Save up to 30 waveforms for later reference, print-out, or download to the optional Smart-V-Link® Software. Smart-V-Link® is a complete vascular software system for performing ABI's, TBI's, Segmental Pressures, Pulse Volume Recordings (PVR) and Venous studies. The Smartdop® 30EX is Koven Technology's newest bidirectional portable Doppler for documentation and assessment of the vascular condition. The Smartdop® 30EX is lightweight and portable with an integrated printer, large visual LCD display, and automatic cuff inflator to facilitate quick, simple, accurate ABI, TBI and PVR studies. Optional PPG and pulse volume modules are available for toe pressures and MVO studies. The built-in microprocessor calculates ratios automatically without the need for manual adjustments. Save up to 30 waveforms for later reference, print-out, or download to the optional Smart-V-Link® Software. Smart-V-Link® is a complete vascular software system for performing ABI's, TBI's, Segmental Pressures, Pulse Volume arterial (PVR) and Venous studies. Michelle Weddell, Business Development Executive and diabetes specialist at Algeos noted: "The range of Koven dopplers are cost effective compared to competitors due to the studies they are able to carry out. All units can do pulse volumes and arterial and venous studies. You can see the pulse waveforms as well as being able to hear the audible signal. These units can be easily attached to the computer to give printable reports for referring to vascular consultants." You can view our Diaped range by visiting http://www.algeos.com or contact Algeos for your free Diaped brochure.